He outlines the major problems with these kind of restrictors being installed in health facilities and how Cubelock restrictors are built to a higher specification to keep patients safe. “I write this with increasing concern that despite The Department of Health, Estate and Facilities Alert EFA/2013/002 being more than five years old, we still see specifications for window restrictors coming through with nothing more than the BS Standard. BS EN 13126-5:2011, the test for window restrictors, was singled out as inadequate by DoH for two issues. Firstly, testing to 500N is inadequate in preventing a determined effort to force a window open beyond the 100mm restriction. And secondly, that locked restrictors can be opened with commonly available flat bladed instruments as well as the ‘key’ provided. The function of the Department of Health, Estate and Facilities Alert (EFA) is to communicate safety and potential risks in the healthcare environment. We believe that the message hasn’t got through to the estate and facilities managers and that they are unwittingly not using the latest guidelines. It is especially important where there are at risk patients, specifically in mental health facilities and where patients may be in a confused mental state. To combat the first issue, while the EFA doesn’t define what is substantial or robust, it singled out that BS EN 13126-5:2011 which tests forced opening to a maximum of 500N, was inadequate. 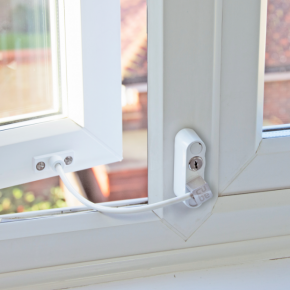 The EFA recommends the potential use of a second window restrictor. To assist estate and facilities managers, we retested our products and confirm that when our keyed window restrictor is used in tandem with our non-keyed fixed version, a maximum holding force of 5250N is achieved, substantially more than what is required in the standard. We would also expect that the addition of our fixed restrictor would substantially boost the maximum holding force of our competitor’s product. We have further tested our keyed window restrictors, which showed a maximum holding force of 1907N and our non-keyed window restrictor 2641N. The second problem of keyed restrictors opening with common flat bladed instruments such as a knife or screwdriver, which break the locking mechanism; we have addressed in two ways. Our key is designed with three teeth, which means it cannot be opened using another instrument, and if for any reason the lock fails – it will fail in the locked position. Which means for new facilities, or where new windows are being installed, there is a single solution that has been tested to adhere to the higher demands. It’s time to get the message out. Thousands of restrictors installed in health facilities may not be giving the level of security required and could be falling foul of their duty to keep patients safe.